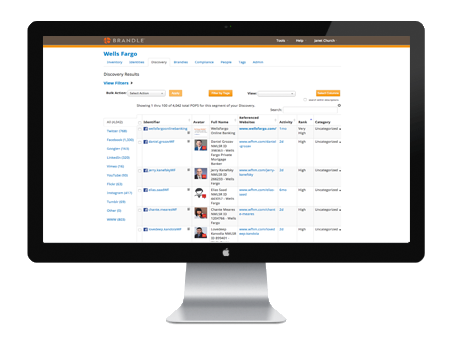 The easiest way to discover, inventory, patrol, manage, and monitor your entire corporate web presence! DISCOVERY AUDIT: Conduct a website, domain and social media presence audit - automatically! LIVING INVENTORY: Keep a complete inventory of corporate, employee, partner, and advocate web properties that never goes out of date. BRAND PATROL: Find new POPs for brands and people on a regular schedule. COMPLIANCE: Manage compliance - regulatory or corporate - and deliver reports to executives and regulators. Thank you for your interest in learning more about how the Brandle Presence Manager can help you manage your corporate web presence. Tell us more about yourself and we will reach out to set an appointment.